Ally's Sweet and Savory Eats: I Won! I have officially won my first food blog contest! Laura, over at Hey, Mom What's For Dinner, recently held a variety of giveaways....and low and behold I won one of them! This is very exciting for me. Can you tell? I am the winner of a panko pack. Do you know what panko is? Panko is a variety of bread crumb used in Japanese cuisine as a crunchy coating for fried foods. Panko is made from bread without crusts, thus it has a crisper, airier texture than most types of breading found in Western cuisine. Now, I have never cooked with panko breadcrumbs, but have always wanted to try....now here's my chance! See what a little wandering about on food blogs will get ya? On to dinner last night. I needed to use up some flour tortillas and I had made a batch of my Snob Salsa, so I threw together Taco Lasagna. Here it goes! Cook chicken in boiling water, or in oven, whichever you prefer. Once cooled, shred with a fork, mix with some of the salsa and set aside. Spread 1/2 c. of salsa in bottom of 8x8 baking pan. Begin layering like lasagna - tortilla, re fried beans, chicken, salsa, cheese, and so on, until you've reached the top of the pan. Bake at 400 degrees for 30 minutes, or until browned and bubbly. Serve with a side of Mexican rice (1 cup of brown rice to 1/2 cup water and 1/4 cup salsa - cook as directed). This is great dish to throw together the day before and keep in the fridge overnight, or even if you need a dish to take to a loved one. Serve with whatever toppings your heart desires - sour cream, lettuce, tomato, crushed tortilla chips (my favorite! ), etc. So, that was my night. 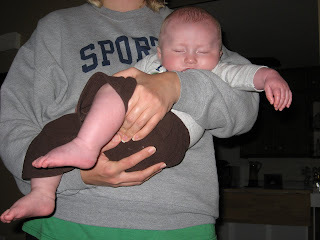 Later....little man feel asleep in my arms as I was walking around the house picking stuff up. Don't you wish you could just fall asleep anywhere? That kid is growing like a weed! Quite an armful, but isn't it great. He's getting so big! I need to make this meal ASAP, it looks delicious. Thanks for playing! I'm so glad you won. Wow your lasagne looks so great! Congrats on winning!!! I was super pysched to win my first blog contest too (just about a month ago)!! I really like the look of that dinner! Great combo of ingredients too. My husband loves anything Mexican so I might give this one a try soon. I'm glad you like the blog Stacy...sounds like you have your hands full! Hopefully I'll have some recipes on here that are easy for you! Aw! That is the MOST adorable picture. I always wish I could fall asleep while sitting in someone's lap/arms. So safe and comfy looking. I love taco lasagna...I've tried rachael ray's version and its yummy. Ally - I made the taco lasagna and LOVED it. Not sure if Mark was a fan cause of the refried beans but I did! Brought some into work for the girls to try.